TGIF! Let me just say that the ugly, unfortunate beginning signs of winter have arrived in Wisconsin, and I am NOT okay with it. I mean, not even in the slightest. I continually try to convince Ryan to move to California, but unless I land my dream job of being an E! News correspondent, I don’t think that’s happening any time soon. Anyways, Ryan and I are headed down to Schaumburg this morning to spend the day with my parents. My mom and I are headed to a local business’ holiday open house to do some damage in the holiday decor department. Wherever you are and whatever your plans are for the weekend, I hope you have a good one! Here’s a glimpse of my week. 1. Just a quick home update – our home inspection last week couldn’t have gone any better. The inspector didn’t find any issues and basically told us that the house is in pristine condition for being 19 years old. Whew! That was a huge relief. Our appraisal also has been completed, and we are less than 30 days away from closing. 2. I don’t think I’ve ever mentioned this here, but I am a Christmas/holiday season fanatic when it comes to decor. I’m pretty sure I inherited that gene from my mom, and it only seems to get worse with each passing year. 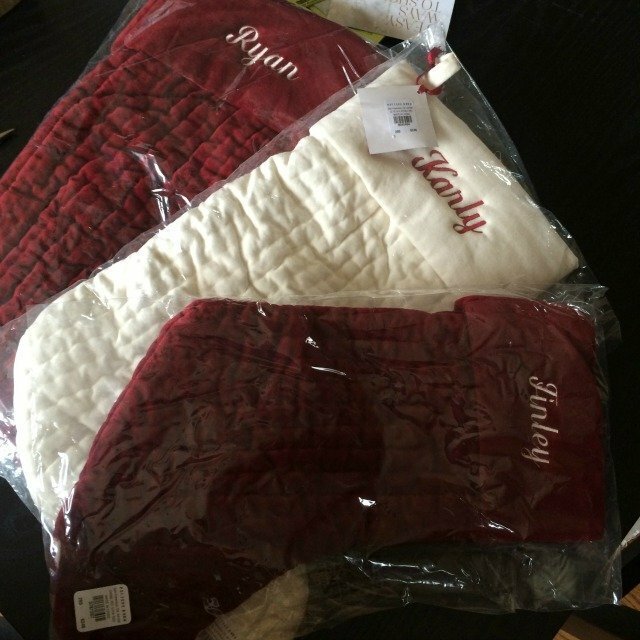 Although I won’t be able to go full out this year because of the move, I did order us our very first set of stockings to hang on the new mantel! Pottery Barn was running a 20% off and free shipping deal, so I couldn’t pass these up. 3. Okay, I really can’t get enough of this scarf. Someone may need to intervene. 4. I finally got my hands on a bottle of Batiste dry shampoo on an impromptu trip to TJMaxx. I probably am the last person to give this brand a try – Nadia swears by it, so I’m intrigued to see if it compares to my favorite Suave dry shampoo! 5. 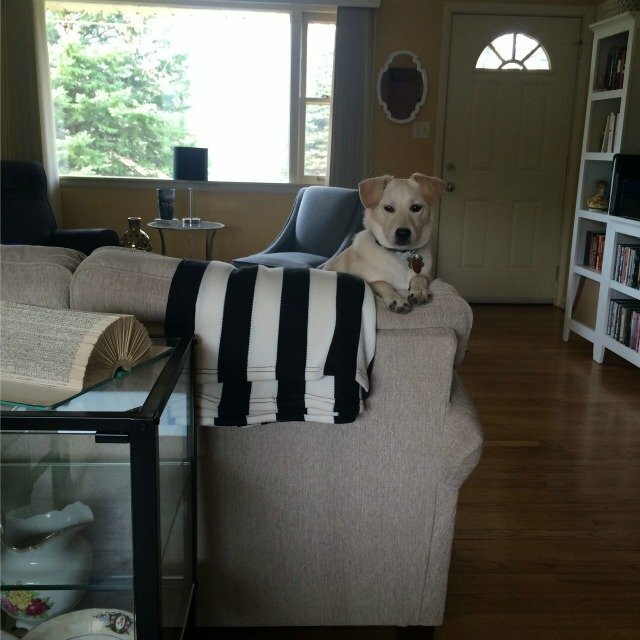 It doesn’t matter where I am in the house or what I’m doing, Finley is always watching me. That’s his favorite watchdog spot, and it cracks me up every time that he crawls up there. He will enjoy that spot in the new home because the couch will be right in front of the window looking out into the woods! Get the latest from What Karly Said delivered right to your inbox. I tried Batiste yesterday, and so far, so good! Not sure if I like it better than my Suave dry shampoo yet, but time will tell. Little baby stockings are the cutest! How fun it will be to shop for that next year. 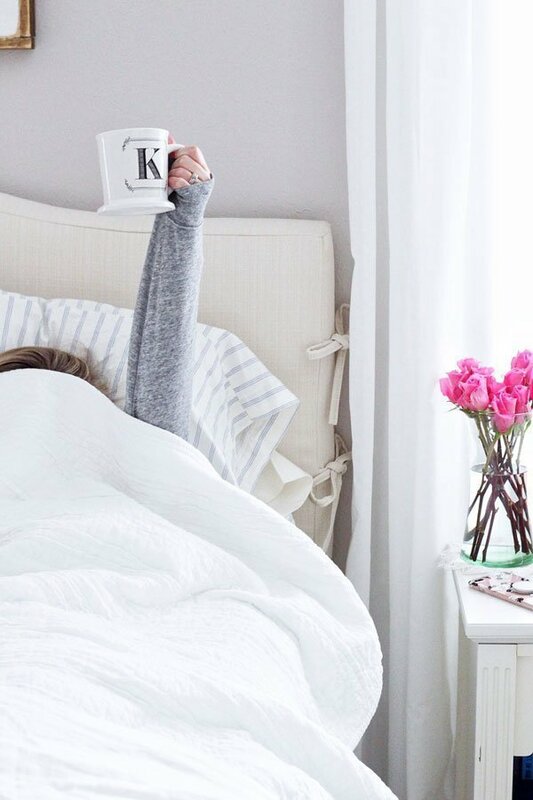 That striped blanket is from Ikea – $20! We don't use it a whole lot, but it makes for good decor. Happy Saturday! How funny – Ryan used to have to work in Merrill all the time when we lived in Madison last year! It's even colder there since it's further north. Happy Saturday! Finn is getting so big! Now that he's 6 months old, I think he' going to start leveling out a bit, so I don't anticipate him getting much bigger. That's fine by me! Happy Saturday! Haha thanks! It also works as carpet freshener, deodorant, a matte agent for your face, etc. Haha! I know exactly where you're talking about, but I've never been in there. I'm going to have to check it out. That's awesome that you've been able to make it a tradition with your mom. Agreed on the shopping! They are so stinkin' beautiful and great quality. Too bad I didn't wait a few extra days for the free monogramming! I definitely will be sharing my thoughts once I use it a few more times! Baby powder, now that's cheap and genius! Wisconsin/Midwest winters in general are just not fun – be glad you only were here during the summer. Happy Saturday! Lol, saving the money for Christmas decorations is the way to go in my opinion! Thanks, girl! I'm really sick of my hair, so I've been coming up with different ways to wear it up without looking like a slob. My mom and I went to the holiday open house at Maggy Magoo's – it's a local business right on Schaumburg road (next to Lou Malnati's). My mom has been going for years, and I've been able to join her the past couple. It's a lot of fun and the cutest shop! We absolutely need to meet up one of these days when I'm in town for longer than a day – I think we'd have a blast shopping together. 🙂 Happy Saturday! Oh I love that scarf!! Where is it from!? 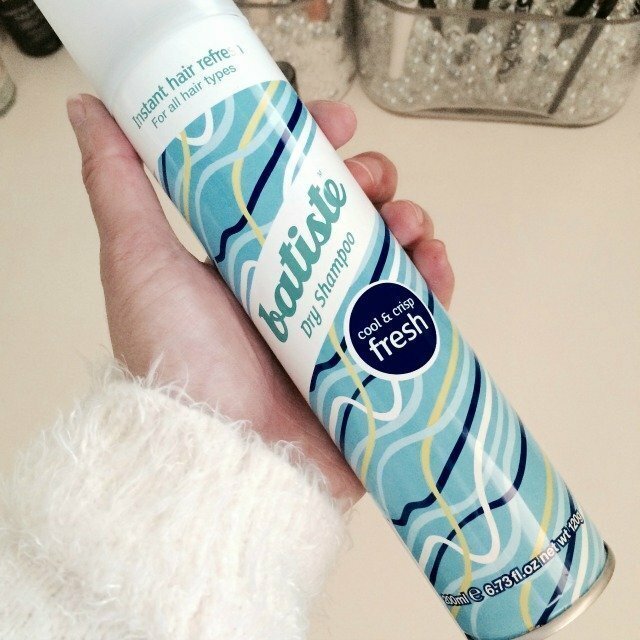 So glad you're finally trying Batiste! I need to look for a different version because the original scent has been bugging me this last time I rebought it! I was sooo close to ordering that scarf when you posted about it earlier in the week, but when I went to look again it was sold out online- probably a sign I don't really need it, haha, but it sure is cute! Finn is looking like such a big boy!! LOVE the stockings – I just ordered ours last night! And I think you'll love the Batiste dry shampoo, it works wonders for me. Happy weekend! I only lived in Wisconsin for a summer but loved it! I guess I never had to experience a winter there though. Finely is adorable and that last picture is perfect. I love that scarf!! I want a scarf like that really bad! I also am obsessed with Christmas deor! its so fun to decorate and feel the holiday cheer all Nov and December! I am a Christmas/holiday decor fanatic too! Zack told me this fall to take a couple hundred bucks and some fall decorations…once I started looking I was like nope, I'm just gonna save this money for more Christmas decorations! Haha, what can I say, I looove Christmas. Those stockings are just the cutest!! Christmas decor is my favorite too, it just makes me so happy <3 So glad to hear inspection went so well, that is awesome! Have a good weekend! 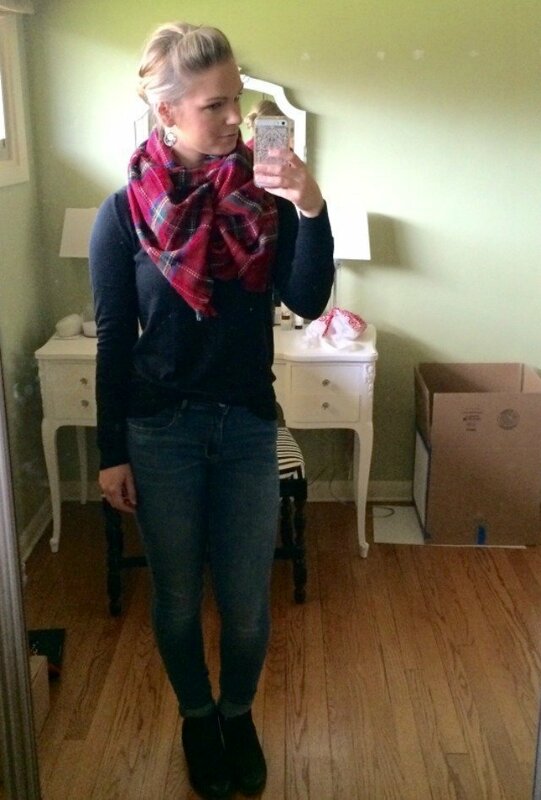 Love how your hair is styled in that scarf photo, I need to get my hands on a blanket scarf this weekend! What sale will you be hitting up in Schaumburg? Super curious since I am also a lover of the Holiday season. Love those stockings! We seriously need to coordinate and meet up sometime you're down here!! Finely is getting so big! I use Batiste and I like it, but I don't think it works better than any other dry shampoo. You'll have to let me know what you think! We're seeing signs of winter here in Michigan too. Bummer. Happy Friday! I've heard really great things about Batiste as well. I'm going to have to give it a try! Love those stockings!! Love those Christmas stockings!! How cute. I want to get that kind next year once we have another member in the fam 🙂 Please tell me where you got that striped blanket! Love it. Have a great weekend lady! Have fun with your parents today! And try not to freeze! My only connection to WI is Merrill and I saw it was 28 there this morning.. whatttt?!? So cold! Love your stockings., so cute! And I still haven't tried Batiste so you aren't alone! Happy Friday! What Karly Said is a Wisconsin-based lifestyle blog. 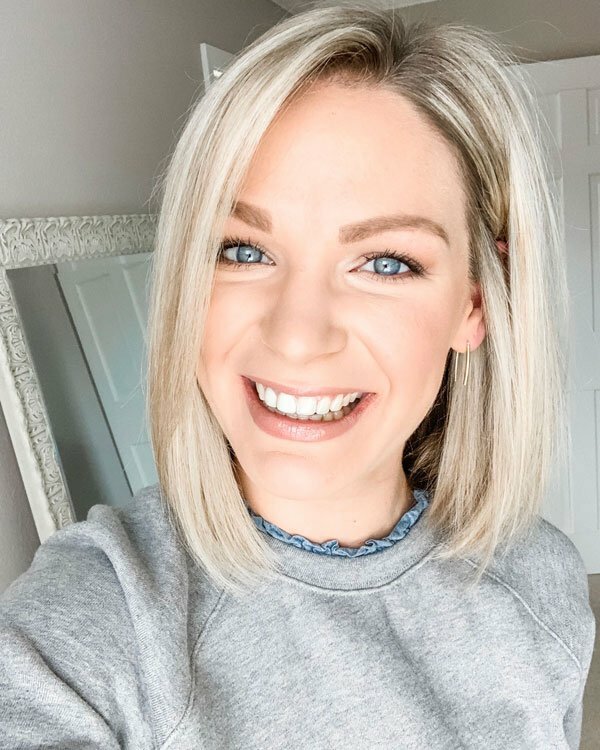 You can find my latest affordable beauty and style favorites, reading recommendations, home decor inspiration, and general life-happenings and thoughts.